IIFYM stands for If It Fits Your Macros, and if you’ve been on the dieting scene for any length of time, I’m sure you’re familiar with the concept on a high level. You figure out your calorie needs for your goal, come up with a set of protein/fat/carb numbers to hit daily, and get to work on fitting the puzzle pieces together. Regardless of whether you’re gluten-free, paleo, vegan, omni, high carb, high fat, you can still pick and choose the foods you want and hit your macros with a little practice. The flexibility allows for freedom in food selection instead of the old fashioned, traditional diets that had you sticking to a limited number of foods on a meal plan. Instead of a meal of 4 oz chicken breast, ½ cup of rice, 1 cup green beans, and 10 almonds, you can focus on foods you enjoy eating and fill a set number of macros with portions of them. Freedom is a great thing! Like anything though, there are plenty of ways to game the system that can end up sabotaging your results and make you think IIFYM doesn’t work or at least doesn’t work for you. People get excited when they find out they find out they can eat anything they want and get results as long as they make it fit. That’s definitely a great benefit to IIFYM over following a standard meal plan, but it’s also one of the downsides. Quite frankly, our eating habits and the availability of fast and processed foods (AKA those with lots of calories and little volume) are a major part of our weight issue. Continuing those habits doesn’t really set you up for success once you decide that you’re done tracking. It doesn’t provide many health benefits either. I see posts with all kinds of macro puzzle pieces to fit in as much fun stuff as possible on the daily. This often leads to eating some really bizarre combinations just to meet your macros at the end of the day. I have 78g of protein, 2g of fat and am over on carbs, what do I eat?! Just look for the hashtag #flexbowl if you don’t believe me. If you’re filling your macros with lots of processed foods and continuing with your pre-diet habits, it won’t give you much in the way of volume or protein, leaving you empty, hungry but without any macros left. Suddenly you’re overeating, falling off plan, and thinking IIFYM doesn’t work even if you follow “the rules.” A small change to your approach can make a big difference. The amounts will vary based on your calorie and macro needs and the above is a very basic starting point, so you’ll need to adjust portions to fit you. Doing this will get you pretty close to your needs and have you eating similar sized meals that have volume and balance. Worried that it’s too restrictive? There’s nothing stopping you from making your carb a cookie or glass of wine at a meal or two. Maybe you’re a little more advanced than a newbie to IIFYM and you’re aware that you need to eat regularly during the day and pay attention to details like overall fiber. Yes, followers of IIFYM set micro goals in addition to macro goals for a certain amount of fiber to target daily. This is a great move, but again, can be easily circumvented with modern technology. Following our usual eating habits, many of us don’t get nearly enough fiber in our meals. Processing foods removes a good portion of the fiber so things like cookies, muffins, hamburger buns, have pretty much negligible fiber content. Companies figured this out and nowadays you see fiber-fortified foods in all forms. They process the heck out of something to make it tasty, then turn around and fortify it with fiber to slap a “healthy” and “whole grain” label on it. Once the protein problem is solvesd, a frequent post I see are flexible dieters asking for tips on how to hit their fiber goals. Great question, but most of the popular answers are things like psyllium husks, Quest Bars, fiber gummies. Ah, the joy of modern technology. As you’re learning and changing your eating habits, these aren’t a bad starting point but long term they shouldn’t be the cornerstone of hitting your fiber goal. If they are, then you’re likely not eating many whole foods. Studies show that whole foods are more filling and help you maintain a lean body composition. How? Foods like apples, beans, lentils, oats, broccoli and single ingredient foods have volume to fill you but they don’t have the same amount of calories as fortified counterparts. Think about the amount of broccoli and apples you’d have to eat to hit 20g of fiber compared to the size of a single Quest Bar. Translation – whole foods fill you up faster for fewer calories and keep you full longer. This makes it much easier to maintain your weight long term even if you aren’t tracking. Plus there’s the added bonus of vitamins and minerals thrown in from nature. When you follow The Steps above and you focus on filling them with mostly whole foods, you get a heck of a lot closer to your fiber goal without supplements or fortification. In the beginning, you still may need to supplement and there’s nothing wrong with doing so with the occasional Quest Bar or throwing psyllium in to your protein shake but don’t rely on it daily for the long term. Take a closer look at food choices overall and see what changes you can make to bring your fiber up naturally. You’ll find it easier to stay on plan when hunger is down and you’re feeling great. So you’re a macro pro and you’re nailing the process of fitting things in, you’re hitting your fiber daily, and you’re loving life. You’ve embraced it big time, and you’re searching out all kinds of macro-friendly foods. That’s a term that’s thrown around for foods with high volume and lower calorie. The holy grail in the IIFYM world. People hit up grocery stores to buy tubs of Halo Top or Arctic Zero, and then they plan their day around eating the entire tub for dessert. It isn’t always a tub of ice cream. Ha, maybe it’s Miracle Noodles or other creation. Sometimes it’s planning the day around a mega-meal where they cram in allllll the macros. They spend the day eating egg whites and lettuce to fit in all the food at dinner or dessert which is effectively a binge at night. What’s the big deal in doing this? If you hit your macros at the end of the day, it works. No problem. On a high level, you’d be right but it goes deeper than that. Basically under-eating for a good chunk of the day and then overeating at night is not a good habit to encourage. You’re training your body and your brain to ignore your hunger and fullness signals. You typically sit through quite a bit of hunger just to eat past the point of fullness later. Over time you’ll have trouble identifying when you’re really hungry and when you’ve eaten too much. That is, you no longer can rely on your body to tell you when it needs to eat and when it’s had enough. Not a great skill to lose if you ever want to stop tracking. It’s really not a good practice to purposely under-eat just to over eat as you can develop a bad relationship with food over time. 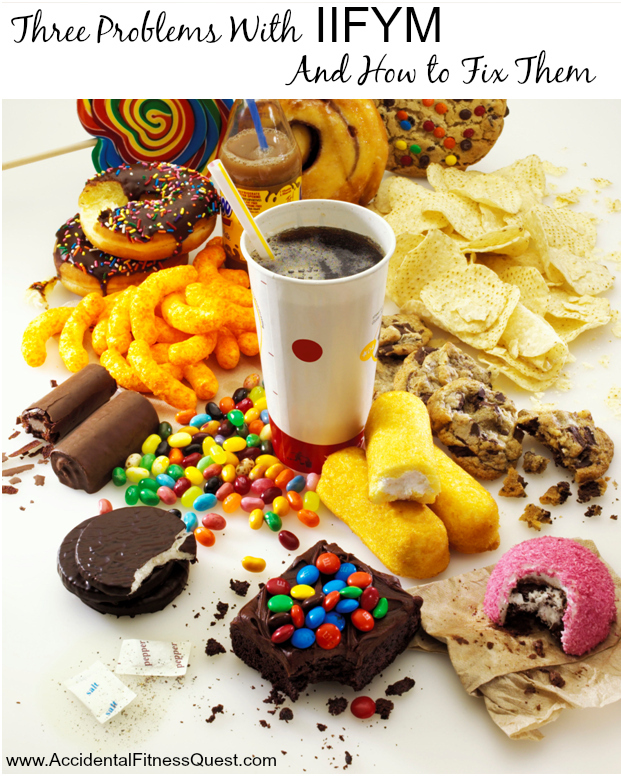 If you aren’t careful this, it can spiral out of control as binges get out of hand. Hunger can take over at that mega-meal and cause you to keep on going well after the planned portion is done. Plus it sets you up to fail before you get to your big meal just from dealing with hunger. So what’s the answer? Again, The Steps. Follow those and get creative with your carbs and fats with a few meals. You’ll end up eating regularly during the day which help with energy and hunger. You’ll get adequate protein and fiber. You’ll also be able to hit that 80/20 rule where 80% of your foods come from minimally processed foods and 20% comes from anything else. You can still have your ice cream, cookies, cheesy things and more, but you won’t be as likely to override your body’s signals and your portions will be more appropriately sized. It might not be as fun, but balance and moderation take a lot less work and jumping through hoops to hit your goals. You’ll be much more likely to keep at it when it’s simple and fast too, so chalk one up for consistency. Following a structured approach like The Steps makes planning much easier and helps with the learning process. It allows you to pick and choose the foods that you want to create your meals. It also gives you the flexibility to work in the fun stuff along the way while meeting your goals. Yes, there is such a thing as structured flexibility. Your goal should be to eat sensibly and with structure to fuel your body effectively so you can perform and feel your best without constantly feeling the need to stray from your diet. Again doing the things above every once and a while isn’t really a problem, but it’s when they’re the norm in your approach that things can head south. If you think that IIFYM doesn’t work or doesn’t work for you, see if you’re accidentally using one of the approaches above and work to fix it. Once you master the basics, then you can take it up a notch. Need help and guidance now in how to do this? Having trouble figuring out the best approach that fits your life and is still flexible and fun? Check out my online coaching options and we can talk about the best approach while changing your eating habits for the long term.